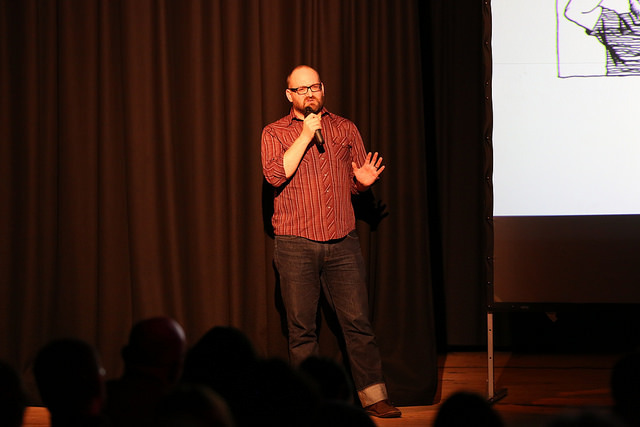 I mentioned a couple of months ago that I was taking part in Creative Dundee‘s Pecha Kucha Global Night – Vol 11 on Friday 20th February 2015. This was a special annual global event developed by the organisers in Tokyo to connect some of the 800 PKN cities around the world. It was a great night with lots of interesting speakers, and now you can enjoy the presentations too! The good folks at Creative Dundee filmed the talks and have uploaded the videos to their website. There are also pictures of the event on their flickr page. You can see my presentation on my own artistic work and events I run such as DeeCAP below. Damon Herd – Pecha Kucha Night Vol 11 from CreativeDundee on Vimeo.